Growing tomatoes is fun! Once your tomato plants are in a well-prepared garden that gets at least 7-8 hours of sunlight a day, much of the heavy work is done. Now you can focus your attention on four important areas of tomato care to make sure you get the best results from your crop. When it comes to growing tomatoes, you need to know two things about watering them. Tomatoes need 1-3 inches of water a week, depending on temperatures. Tomatoes need consistent watering (rather than daily or sporadic watering). Regular watering not only helps plants thrive, but also helps prevent many tomato diseases, cracking, and blossom-end rot. Do your crop and yourself a favor by establishing a consistent watering schedule. It’s not hard. It just takes a little bit of planning and an eye on the weather radar each week. You can also help your growing tomatoes maintain a healthy moisture balance when you apply mulch 3-5 weeks after planting (and no earlier). What's the best mulch for growing tomatoes? Tomatoes are fast growers. They require significant amounts of nutrients to put out branches, develop blossoms, and form fruit – all in just a few short weeks. The tomato fertilizer you added when planting will last only a short time. Help your growing tomatoes thrive by continuing to give them the nutrients they need. Apply tomato fertilizer once fruit is set and every 3-4 weeks afterward. Create a simple feeding schedule. You can also coordinate watering and fertilizing schedules to simplify tomato care. Staking your tomatoes isn’t 100% necessary, especially if you’re growing tomatoes of a dwarf or bush variety. But for most indeterminate tomatoes, staking means the difference between a larger, healthier crop and a so-so one. Staking can be a one-time step when you use tomato cages, tomato spirals, or even a tomato trellis. Tomato stakes, on the other hand, while less expensive still require that you check plants at least once a week and tie new branches to the stake for support. This is one area of tomato care that requires you to make a decision fairly soon after planting. Growing tomatoes don’t wait for you to stake them. Try different ways of staking tomatoes and find out which method works for you. You can also choose a combination of tomato staking methods, using cages for some tomatoes and stakes for others, for instance. Tomatoes are the most popular home garden crop in the U.S. Unfortunately, tomatoes are also extremely popular with garden pests. The good news is that with just a little diligence, you can help keep your tomatoes healthy, disease-free, and pest-free. When you keep a regular eye on your tomatoes and see problems, you’ll be able to treat them right away. That means healthy tomato plants and a big crop of juicy, best tasting tomatoes. Get more tips on our Tomato Growing Tips Pinterest board. 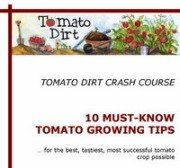 Grafted tomatoes: what are they and why grow them?